Prevent falls (for example, by removing loose wires, cords, and rugs around your house; wearing sturdy rubber-soled shoes; installing grab bars in your tub or shower) so you can stay active. Who should get tested for osteoporosis? An initial examination for osteoporosis is recommended at menopause if you have risk factors. There is a direct relationship between the lack of estrogen after menopause and the contribution to osteoporosis. Because symptoms of osteoporosis may not develop until bone loss is extensive, it is important for women at risk for osteoporosis to undergo periodic bone testing. 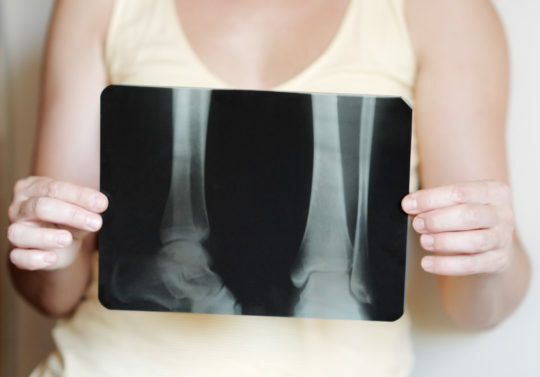 Ddual-energy X-ray absorptiometry (DXA) is the most accurate and best method for measuring bone mineral density. Two X-ray beams are projected onto the bones. The amounts of each X-ray beam that is blocked by bone and soft tissue are compared to estimate the bone density. DXA scanning is fast and exposes the person to very low doses of radiation. It is used to measure bone density in the hip and spine. How do I prepare for a bone mineral density test? Before having the test, be sure to notify your doctor if there is a possibility that you may be pregnant. You do not have to change your daily routine before this test. Eat, drink, and take your medicines as you normally would. However, do not take calcium supplements (such as Tums or Citracal) for 24 hours before the test. On the day of the test, remember to leave valuables, such as jewelry or credit cards, at home. For the test, you may be asked to wear a hospital gown. You will then lie on your back, on a padded table, in a comfortable position. The lumbar spine (lower back) and the hip are the skeletal sites usually examined by bone densitometry. Peripheral dual energy X-ray absorptiometry (P-DXA). P-DXA is a modification of the DXA test. It measures bone density in outlying or peripheral areas of the body, such as the wrist. P-DXA exposes the person to very low doses of radiation. P-DXA cannot be used to measure density of the bones in the hip and spine, and it has limited usefulness for monitoring the effects of medication used to treat osteoporosis. Dual photon absorptiometry (DPA). DPA uses a radioactive substance to produce radiation. It can measure the density of the bones of the hip and spine. DPA exposes the person to very low radiation. Ultrasound. This method uses sound waves bounced off the bones to measure bone mineral density, usually in the heel. Ultrasound is rapid, painless, and does not use potentially harmful radiation. Ultrasound cannot be used to measure density of the bones in the hip and spine, and it has limited usefulness for monitoring the effects of medication used to treat osteoporosis. Your doctor will determine which X-ray approach is best for you. After the test is performed, your doctor will discuss the test results with you. You can resume your usual activities immediately.